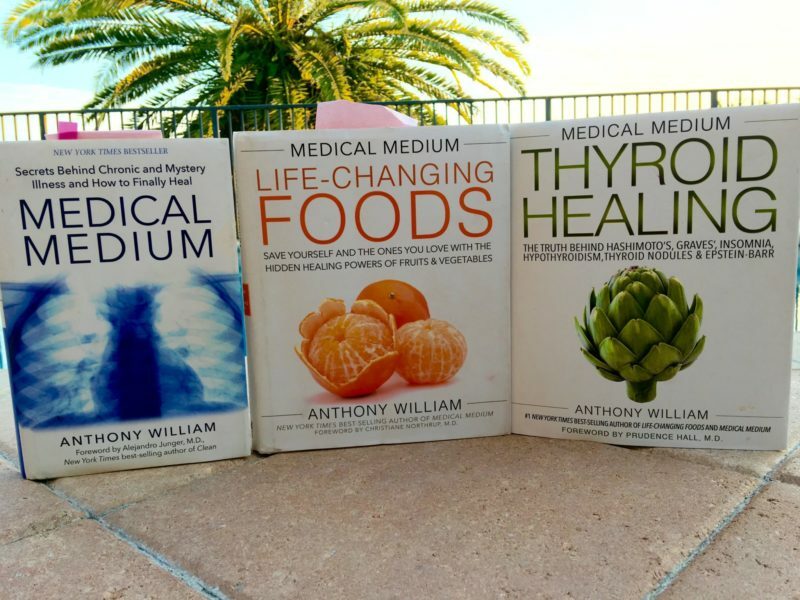 The Medical Medium website and Books, by Anthony William, have changed my life. A friend introduced me to his first book called “Secrets Behind Chronic and Mystery Illness and How to Finally Heal”. I ordered the book and could not wait to start reading it. What I did not realize was that this was going to be the most important book I have ever read. If you know me, I am a science geek. I love learning about the body, human anatomy, nutrition and how the body works at the cellular level and of course fitness. Reading every new health and weight loss book to stay on top of trends. By trade, I am a Holistic Health Practitioner as well as a Nationally Certified Personal Trainer. Let me give you my health background so you understand where I am coming from. As a teenager, I was diagnosed with Mono-Neucleosis not once but twice. Then in college, the diagnosis was Epstein Barr and Chronic Fatigue Syndrome. I went from doctor to doctor trying to find out why I was so tired and run down. The doctors could not figure it out. Until I went to one doctor in New York City who told me to change my eating habits and put me on a regiment of supplements. After about 3 months I felt better than I had in years. Life continued and I went on to have my first baby. When I was 9 months pregnant I lost my father, the rock of our family. Needless to say, it was a sad and stressful time. Not long after that, I lost my only brother to complications from the disease Hemophilia. My world felt out of control. You can read my whole story here. After my third child, I was out of shape and overweight and decided to join a gym. To make a long story short I transformed my body and life. I was in the best shape in my life. Started to compete in figure competitions which entailed strenuous exercise and clean eating. But my body was talking to me and I broke out with the Shingles rash across my back. I will never forget being in the best shape of my life on stage at the prestigious “Arnold Sports Festival”. What the heck was going on! I could feel my body starting to slow down. My energy was not where it used to be, I was dragging. How could that be I ate so well, juiced, drank green smoothies and new so much about health and nutrition. The Doctor diagnosed me with Hashimoto’s Thyroiditis and a nodule on my Thyroid and wanted to put me on medication. Taking medicine is not my thing. I would figure out how to heal it myself naturally. Then one day I lost the pigment in my skin on both of my shins, across my throat, chest, and parts of my forehead, cheek, and chin. I freaked out! The areas were biopsied and the Dr. said it was Vitiligo. The answer I kept getting from Doctors was that I had an auto-immune disease and my body was attacking itself. Oh heck no I said to myself! As you can see my body is starting to heal. The Vitiligo on my face is nearly gone and the spots on my chest and neck are starting to fade. Something I thought would never happen. I took the photo in 2015 when my vitiligo first appeared. I was out by the pool and came inside and had these white spots on my shins, face, and chest. I went from Dr. to Dr. had a biopsy to confirm Vitiligo. They did not know what to do. I just kind of gave up for a while. I was depressed, I bought a lot of long dresses, and large necklaces and just tried to cover everything up and live my life, thinking there was nothing I could do. I looked for help/cures online but nothing really helped or was just way too confusing. I bought Anthony’s first book in April of 2017. It took me a few months to get on board and in the last 8 months, I have done the protocol that I list here on the blog post, supplements, healing teas, heavy metal detox smoothie and CELERY JUICE. Plus yoga and increasing the amount of fruit I am eating. So not it did not take me 2.5 years to start seeing progress, more like 8 months. Everyone was asking me for more photos, especially on my face so I found some. Here you can see my chest and neck where the spots are starting to fade. In this photo, you can see the spots on my chin, left side & right side of my nose, very faintly in this photo you can see my forehead and my hairline have white spots. 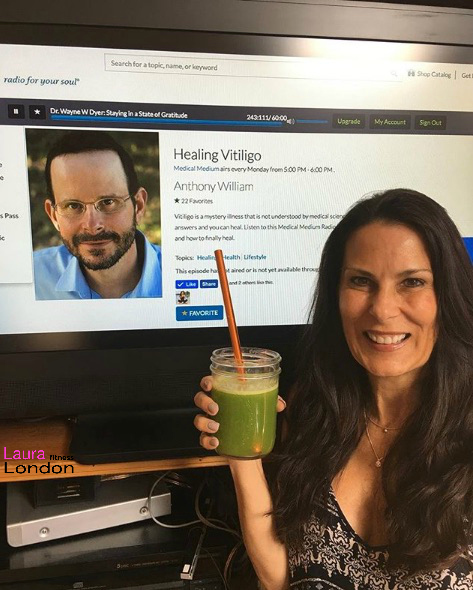 When I started reading Anthony William’s book “Secrets Behind Chronic and Mystery Illness and How to Finally Heal I could not believe what I was reading. It was as if he personally wrote this book for me. He explained what the Epstein-Barr virus is how it progresses in the body. It can lay dormant usually in the liver for years until a stressful or traumatic event happens (competing/weight training & death of family members) when your immune system is at its lowest and then it takes hold even deeper. 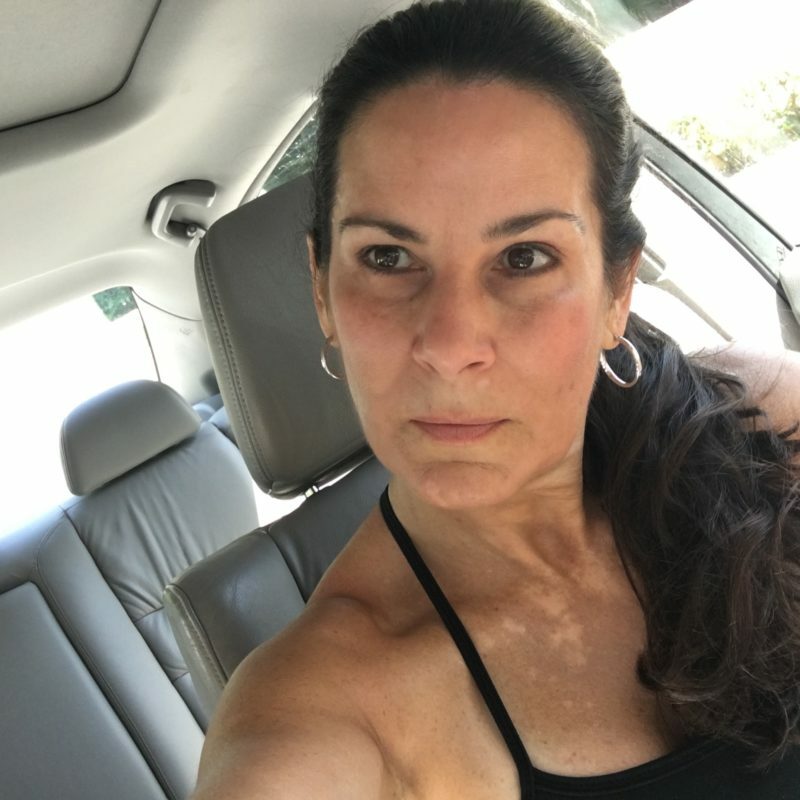 For me, it progressed into the Shingles Virus, then moved into my Thyroid where my body tried to protect itself by walling off the Epstein-Barr virus creating a nodule to protect itself. No doctor, or holistic practitioner was ever able to explain all the symptoms and why they were happening before. Except for “Spirit” and Anthony William. Healing protocols are going to be different for everyone. Being a holistic health practitioner I was already gluten free, eating my fruits & veggies, dairy and soy free. This first thing I did was to take out eggs. They are a food that the Epstein-Barr virus loves to eat! Yes, I said eat, they eat foods and love heavy metals. In his first book, Anthony has a 28-Day Healing Cleanse & Healing Meditation Techniques that you can follow. His second book Life Changing Foods Book is off the charts amazing. It’s not a recipe book (though it does have recipes) it describes healing foods, how they work in the body, their benefits, emotional support they give and spiritual lessons they teach. If I had to pick one thing to start to implement it would be juicing celery juice. It has made such a huge difference in my body. When I first started juicing it I could only do a little at a time. But now I have grown to love, respect and appreciate what it does for my body. The second food I would highly recommend incorporating into your diet right away would be WILD BLUEBERRIES. Not the kind you find in the plastic clamshells at the grocery store. Those are cultivated blueberries similar to farm-raised salmon. I get my wild blueberries in the frozen food section of the health food or grocery store. Wild blueberries are loaded with antioxidants, they have the highest proportion of antioxidants of any food on the planet. Plus they taste amazing! Fruits & Veggies should all be organic if possible and budget allows. Upon Waking – I drink a very large glass of lemon water. This helps detox the liver. Mid-Morning – 1 piece of fruit (apple, orange, pear or melon), celery sticks, a few dates or figs and raw pumpkin seeds if I am still hungry. Or a banana with almond butter. Lunch – Large green salad with veggies, homemade dressing. A sweet potato or baked potato plain. Sometimes I will eat wild salmon with veggies. Mid-Afternoon – It may be another Heavy Metal Detox smoothie or fruit with celery sticks or my favorite Raw Crunch Bar. Dinner – Large homemade vegetable soup, or a large green salad or a raw dish like my zucchini noodle bowl. Or try my Sweet Potato Spaghetti Recipe. Evening Tea – I choose from one of 4 different herbal teas that specifically help with my ailments. Licorice root, cat’s claw, nettle leaf, or raspberry leaf. Healing herbals teas are also a staple in my daily healing routine. Please don’t underestimate the healing benefits of herbal teas. This is a list of the teas I use. I rotate them and choose what tea is calling to me that day. You can find a whole list of recommended teas and supplements on the Medical Medium Blog. I love lemon balm and use loose leaf lemon balm and mix it with a tea bag of Cats Claw, Raspberry, Nettle Leaf or Dandelion tea. Follow along and make a detox smoothie with me. This is from one of my FaceBook Live videos. I started slow with the supplements and slowly added more to my regime. I tried to list them in the order I started taking them. On the Medical Medium website, you will see all the supplements Anthony recommends. Pick the supplements that call to you and your current health issues. Here are the supplements I use and take today. I had given up on healing my body. I walked away from my popular YouTube health & fitness channel because I did not have the energy anymore. Having the Vitiligo on my face and body I also did not want to get on camera anymore. My symptoms may be mild compared to yours. I know you can heal your body. Will it take work? yes. Will it take dedication? yes. But you can do it. I believe in you. I know beyond a shadow of a doubt my family, friends and my social media family love me because I am me. Not because I have spots on my face but because I am me and that will never change. Just like you are beautiful and amazing just the way you are. Did you know there are fashion models with Vitiligo? Visit @WinnyHarolow on Instagram. She is absolutely gorgeous! Cover Girl makeup featured they’re first ever model with Vitiligo in a new ad. My point is don’t let anything hold you back from being who you were meant to be. The world needs you and your amazing gifts and talents. So go out there baby and SHINE, SHINE, SHINE. Have you read the Medical Medium Books? Share your healing story with us below. I love hearing from you. Disclosure: We are a participant in the Amazon Services LLC Associates Program, an affiliate advertising program designed to provide a means for us to earn fees by linking to Amazon.com and affiliated sites. When you purchase from this page, a very small commission is earned to support this website at NO ADDITIONAL COST to you. Running a website incurs overhead costs, so THANK YOU for your support. I very much appreciate it. Thanks! These are great tips! 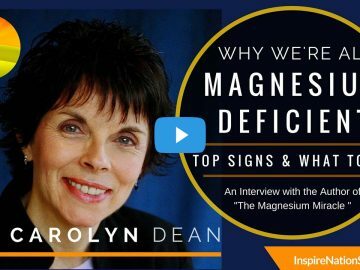 One of the things that I have incorporated into my daily routine that has helped me a lot is iodine supplements. I take it everyday, and it has helped with my metabolism so much! I definitely recommend everyone tries it out. we cannot make iodine on our own and it is essential for our thyroid, so I have seen a difference since incorporating iodine into my diet! 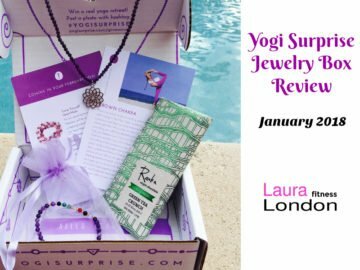 Laura, thank you so much for sharing your healing journey. It’s so very inspiring to me and after reading your post on Medical Medium’s page today, it has given me some hope. I just purchased the first book and I’m just letting the information sink in (as it’s contrary to so much I have heard over the years). I am hesitant in making the diet/nutritional shifts…. and appreciative of any insight you have. For years I have lived off 100-calorie whey protein shakes. As you can imagine, I don’t think that has helped my “Mystery Illnesses” … quite the contrary. However, with food eliminations and suggestions from doctors about eating no-carbs, that is what my diet has become… 3-4 shakes a day with some veggies and a veggie burger for dinner. I still eat keifer but have stopped eating eggs. I have the “fear of fruit” Anthony speaks of. I eat maybe 5 apples a year… that’s it. No bananas, no berries, no melon…. nada. Warding off candida and concern of weight gain were the dominant reasons. So Laura, any pointers on making the transition from eating low calorie meals to 3x that (i.e. smoothie), eating more fruit, less protein… all while not gaining fat but gaining muscle? Thank you for your insights, it is empowering to see your success with this type of protocol while maintaining a fit and strong. Hi Kerri. Food from Mother Nature is love for your body. It will nourish every cell in your body. I would suggest reading his book from cover to cover and listen to his audios on Sound Cloud. Switch your whey protein shake to a vegan brand. You can see the brands I use on my Amazon Store page: Amazon.com/Shop/LauraLondonFitness Fruit is a must do add in what you love, don’t be afraid of it. You need the carbohydrates, vitamins, and minerals that are carried in the high water content of fruit. Add in the detox smoothie and lemon water in the morning. Start there and be consistent for 2-3 weeks. Then add in celery juice. Start with 4 ounces and then increase. Doing these things will start to heal your body. What you have been doing in the past will not help your body to heal and become stronger. Please keep in touch and let me know how you are doing. I also work with people one on one to help guide them. I use loose lemon balm tea leaves and then I add to that a bag of cat’s claw or another tea. I like to alternate the teas. They all are beneficial. One day it may be lemon balm and fennel or licorice root. There is no right or wrong. The best thing is to drink any of the tea combinations daily. Hi Helen. The medical medium and the protocol that I used here has helped me so much. Read his book because it truly will be life-changing for you. He just did a webinar on Vitiligo. I will see if I can add it to this page. Please let me know if you have any questions. I also work with people to help them put everything together to make it easy and doable. Thank you Laura for sharing your knowledge and healing. I was happy to find your site since I am very similar to you. I have hashimotos, vitiligo, IBS, and chronic fatique syndrome and had a bad case of mono as a teen. I also love bodybuilding but lost all drive and energy to move. I would get out of breath just walking up one flight of stairs. I thought I was eating healthy avoiding sugar, (avoiding fruit because I thought it was high in surgar), dairy, gluten, eating organic, etc., but just wasn’t enough and kept gaining weight up to 200 lbs. Finally, I found the Medical Medium books and the answers I needed. 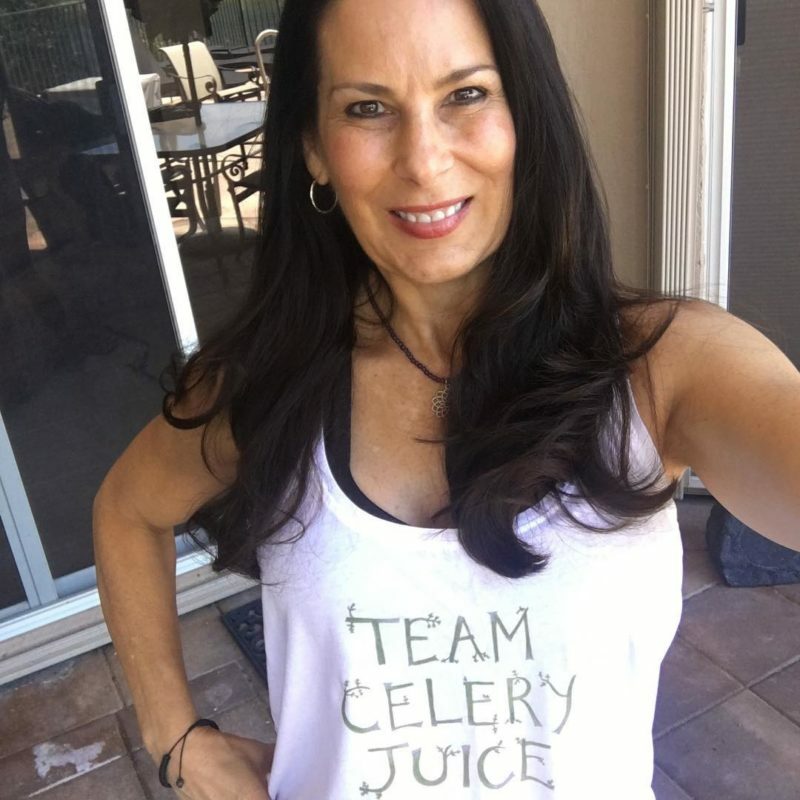 I have been on the protocol for over a month, drinking celery juice, making detox smoothies and following the recipes, and I can not believe the difference in my energy level, I have energy back and motivated to exercise once again. Hoping to see results with my vitiligo, but learned to live with it. The main thing is to live life to the fullest, finally at 52 years old. I look forward to reading more of your blog and watching your videos. I want to start a blog as well, healinghashi.com, hopefully, showing some progression, and helping others with this since no one should have to live with these symptoms. Please keep in touch and THANK YOU!!! Hi Kathleen. I am so happy to hear you are starting to feel better and following the Medical Medium protocol. It truly is life-changing. He is doing a show on Vitiligo Monday, June 25th at 5 PM EST. You can listen at http://www.hayhouseradio.com I am so glad you found my blog. I am always posting more workouts, recipes, and interviews. I think you should start your blog! Go for it. You can be fit and fabulous at any age. Keep me posted on your progress. It says July 2015 on your before picture and Feb 2018 on your after picture. 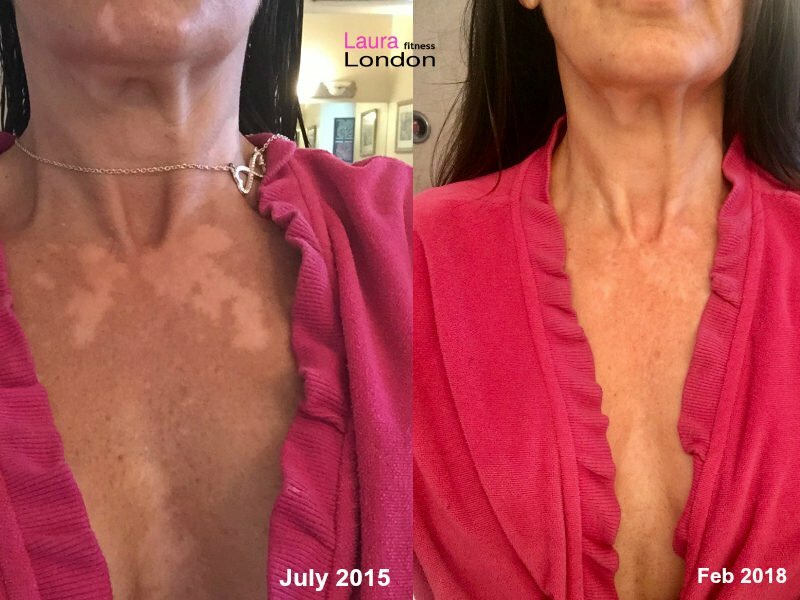 So did it really take 2.5 years for you to make progress on your vitiligo? 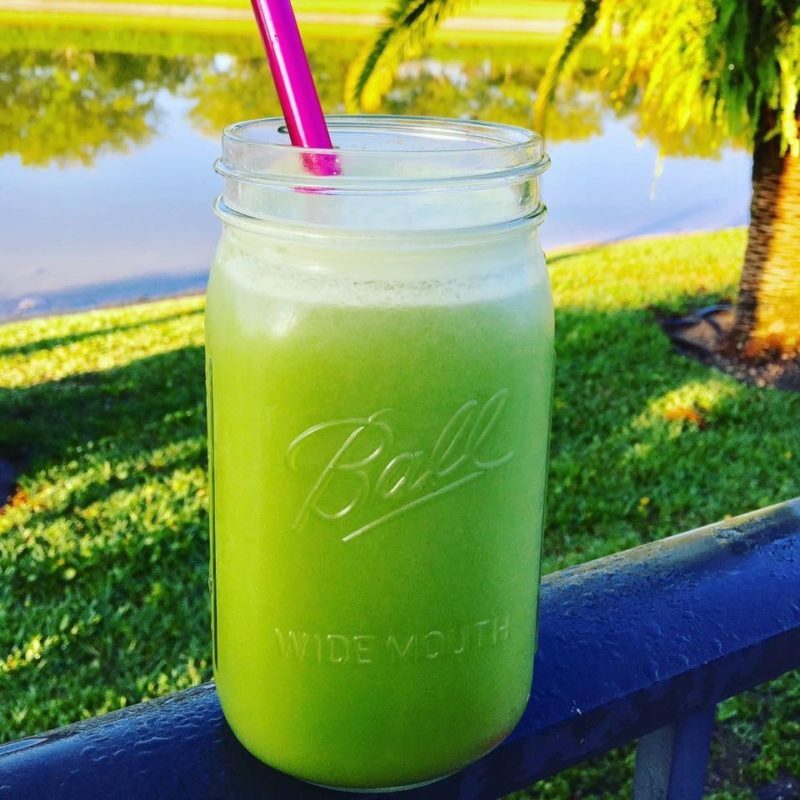 Have you been drinking celery juice every morning for the last 2.5 years? If not, could you please write down what exactly did you eat/drink/take and for how long you did it, so that we can do the same and have some idea on the healing time? Otherwise, despite doing the exact same things, people end up giving up because they think they don’t see any results in 1 month. Hi. That is a great question Okan. I took the photo in 2015 when my vitiligo first appeared. I was out by the pool and came inside and had these white spots on my shins, face, and chest. I went from Dr. to Dr. had a biopsy to confirm Vitiligo. They did not know what to do. I just kind of gave up for a while. I was depressed, I bought a lot of long dresses, and large necklaces and just tried to cover everything up and live my life, thinking there was nothing I could do. I looked for help/cures online but nothing really helped or was just way too confusing. I know messages come to us when we need it. I happen to listen to a audio recording this morning by clicking a link on FB which talked about Lectin. I then Googled the Medical Medium and discovered he talks about autoimmune diseases. I was so happy to see Vitiligo on the list. My boyfriend has been suffering with Vitiligo for the past 4 years It’s taken over his face and hands. He has tried many things, but he now believes nothing will ever help him because everything he reads says ” there is no cure for Vitiligo” He has see several Doctors including a holistic Dr. There is also mixed messages about what to eat or not eat that can make it worse or help the white spots fade. He currently lives in a different country, but will relocate back where I live in the U.S. hopefully within the next few months. At this time I will love to start to help him realize that he can get rid of Vitiligo and feel GREAT about how he looks and feels. I loved seeing your before and after picture, I would like you to post pictures of other area of your body and face so I can show him more proof that you healed your body. I would love your help. I will be upfront and say funds are very limited for any additional supplements and organic food, I am a single mother of 7 years and bascially had to start from scratch a few years ago after I lost my business and house as well as losing my husband. I would at least buy the most important supplements for him. When he comes back to the US he will need to find a job, and that may take a while, so I am willing to assist until he gets on his feet. Please let me know what book to buy and the first things to do. He eats everything and loves all kinds of meat, fish, and veggies. Cutting meat out of his diet will not happen, also he drinks alcohol and I think he may also resist cutting that out as well. Thank you for sharing your personal story. Hi Lutchmie. The Medical Medium is helping so many people to improve their health and heal their bodies. There is hope to help heal and possibly reverse some and maybe all of the vitiligo. I am not an expert on this but can only speak from my own personal experience. I too had given up after going from Dr. to Dr. Until I found the Medical Medium. Reading his books and listening to his audios has been life-changing. I do still have Vitiligo on my neck and chest but they have faded a little. I am still a work in progress. I will see if I can find those before photos too. I would suggest getting Anthony’s first book and start with juicing celery juice 4-8 ounces a day. Next step is to add in the heavy metal detox smoothie. Keep me posted. Sending healing energy. You were mentioned on a Medical Medium’s Instagram post that you have healed your Vitiligo. 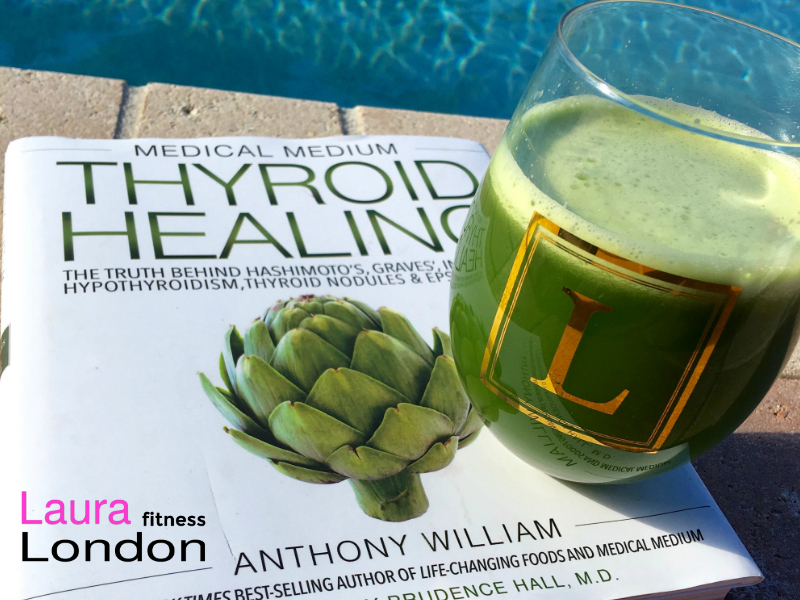 Life Changing Foods and Thyroid Healing. I have already taken gluten, nightshades, nuts, seed , been, grains, soy and fruit out of my diet. Some of the Thyroid Healing protocols seem to be very daunting. What is the best place to start? If I just did the celery juice will I see any healing? I would love your advice. Hi Liz. 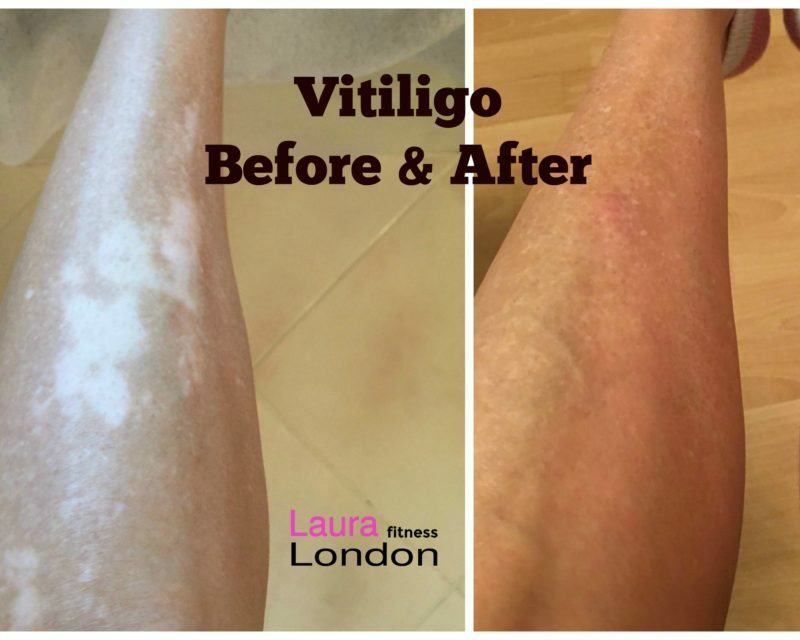 Let me clarify I have improved the vitiligo spots and my legs and face. I do still have them on my neck and chest which is closest to the thyroid. I am still a work in progress. 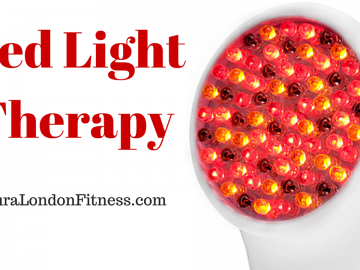 I wrote this post so people could see what I have personally been doing to help heal my body. Yes, the first thing to do would be to start with 4-8 ounces of the celery juice daily. I sometimes juice at night and then will have it ready in the morning. I know fresh juiced is the best but not always doable. So think no right or wrong just doing your best. The second thing would be to add the heavy metal detox smoothie. I just posted a video of myself making it on this blog post. Add back in fruit. Fruit is very healing, anti-viral, full of anti-oxidants, vitamins and minerals that the body needs. Keep me posted on your progress. Hello,I just get result that I have vitiligo. I do have hashimoto as well. I bin juicing celery for past two weeks.Now I need to add more supplements and detox juices. After reading your story ,I have hope. Thank God for Medical Medium. Hi Fatima. 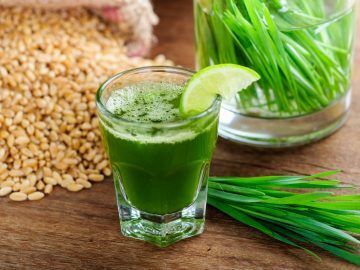 You can heal from these “Mystery Illnesses” be consistent with the celery juice and the detox smoothie. Then you can start to add in other protocols like healing herbal teas and supplements. You got this girl! I am here for you. I will be adding more info to the blog to help support Hashimoto & Vitiligo. Stay tuned. Thank you so much. There was a reason I recieved your post today on instagram via Medical Medium. I have few spots of vitiligo and few have healed completely. However what are remaining will heal this year I believe. I am starting to read the book from today and check with you if I need any help. Thanks Laura. I’m Vaishali Potadar from India. Hi Vaishali. I am so happy that your Vitiligo sports are healing! Keep doing what you are doing. The Medical Medium book will help you a lot and I am here if you have any questions. So glad to see you’ve written an article on your Medical Medium protocol journey! Its very encouraging 😊 I also love his books and soundcloud podcasts. I also follow a very similar drinking/ juice/ eating schedule. I didn’t go “whole hog” until this year. I have two resources for oil free dressings. If you have any favorites to share that’d be fantastic. Hi Tracie. My heart goes out to you and your daughter. I like your daughter has tried so many things. There always seemed to be something missing. The Medical Medium is the missing link. I would recommend you start with his first book Medical Medium – Secrets Behind Chronic and Mystery Illness and How to Finally Heal. This was the starting point for me. I can’t even express in words how much this information has changed my life and I have been on a 30 year + journey. The original photo of my legs was taken in July of 2015. I honestly thought there was nothing that could be done. I have not posted my face & neck yet. I ordered his first book in April of 2017. So it has taken a year to get where I am today. I already ate healthily, but adding in the celery juice, detox smoothie, eliminating eggs, drinking herbal teas and adding in supplements for my issues were the kicker and most of all “Believing That I could Heal” was half the battle. I had given up. This is my email lauralondonfitness@gmail.com please feel free to email me and we can discuss this more. I would also suggest listening to his audios. I use the “Sound Cloud” app on my phone and listen to the Medical Medium all the time. The information and knowledge you will learn is priceless.